Lively, bright lemon hues are mixed with hints of deep blue for a stunning, warm tribute. 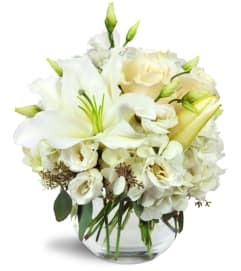 As a gift or gesture of sympathy, it’s a perfect way pick-me-up for any occasion. 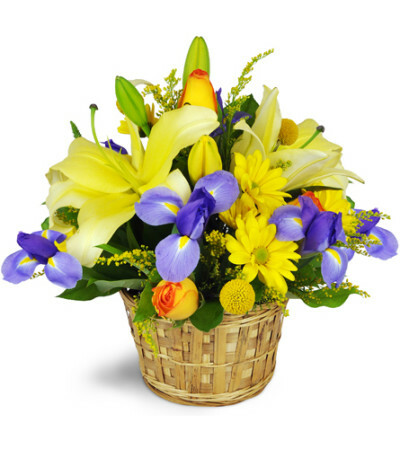 Yellow lilies and daisies, blue irises, and orange-tinted yellow roses are gracefully arranged in a sweet bamboo basket. My girlfriend loved the arrangement I sent her for Valentine's Day from Hoffmans. 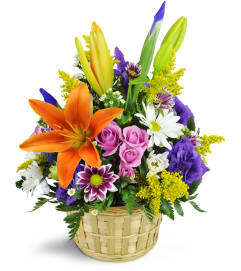 The flowers are always fresh and arranged beautifully. Thank you for her day. Thank you for your caring and professional service! Hoffman's Florist & Greenhouse is a Lovingly Florist in Columbus. Buying local matters. Discover how Lovingly supports local florists. Copyrighted images herein are used with permission by Hoffman's Florist & Greenhouse.